Wrong scale for me but that's some impressive modelling. Funny you should say that as I managed to break my magnifier yesterday by knocking it off the table and had to do the back end of the second one and all of the third one without it! I guess my eyesight (and luck) is better than I thought! Indeed, you can see all kinds of nasty bugs but sometimes you can see tiny axle boxes and 0.1 mm bow pen lining too! It's also good for finding all the stray bits of dust and cat hair you thought you'd eradicated during the previous session. However, I need to buy a new magnifier before I can do any more fine lining as I think I've pushed my luck enough with the bogies! Blimey, I go away for two days and miss all the action! Nice artics. Thanks Graeme, unfortunately this is all the action that'll be seen on these for a little while now. I've been working on a non-LNER project for the last few months and I am looking forward to clearing this one off my desk! However, there is also something a little closer to the mark (but sadly out of period for my personal tastes) also in progress. 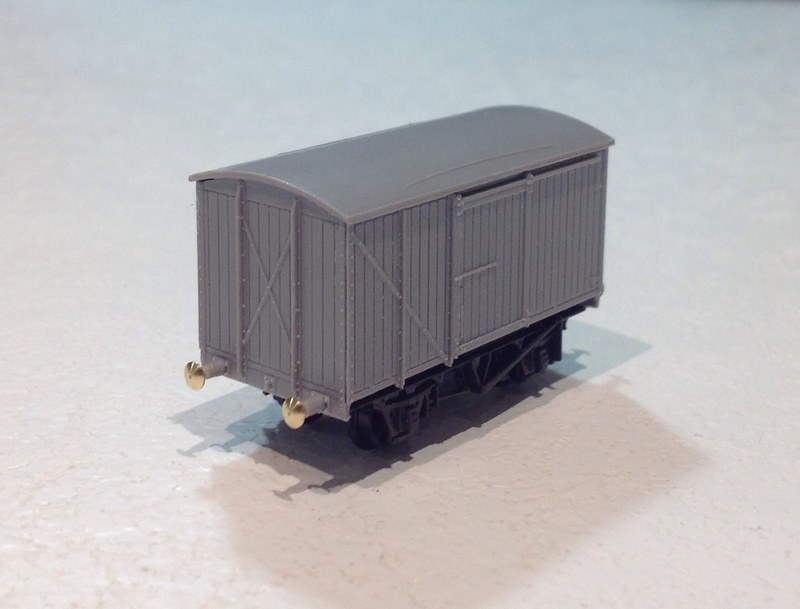 I've been playing with a new printer recently, below is a print of one of my Dia 23 Fish vans. Other than removing the supports and priming, this is how the van came off the printer - no post cleaning. There are some subtle build lines but you need to be closely inspecting the van under a strong light to see them. My last build of 2019 and not even an LNER prototype! I've spent the last couple of days working on a Howlden Lavatory Composite from Nick Campling's drawings. As far as I can work out from my copy of 'LNER Passenger Trains and Formations', this design of coach made up part of the 1934 2.04pm Cambridge-Kings Cross (secondary) express. Interestingly, this was the only non-gangway coach in the rake but was positioned as the third coach in the formation. The roof is actually a separate part which I hope to be able to hold in place using magnets while the solebars, body and interior make up the second part. This is all a bit of an experiment to see if the printer can handle a design like this. Another interesting coach in the six vehicle rake was a clerestory open third. I've found a set of drawings from an old copy of Model Railway Constructor but they don't have an interior plan so I might have to order a set of Isinglass drawings (as I will for the remaining two coach designs). The GN Luggage Compo No.461 was still in the 2.4pm ex-Cambridge in the Winter 1936-7 Carriage Working. Thanks John, that is good to know. The train is just crying out to be modelled as it is only six coaches and the longest is 58ft 1.5in so it'll be nice a short for one of the shorter kick back sidings. I've been looking at the Howlden non-gangway 45' full brake as it would seem that these found their way onto trains that would be suitable for Hadley Wood. Something that I've noticed on Steve Bank's site is that the layout of the paneling, doors, duckets, etc seem identical to the ECJS 46'6 clerestory full brake. Is that really the case? If so, I think that it would be easy enough to CAD the Howlden 45' full brake and then modify the file to represent the gangway clerestory version. Send me a PM about the Open Third. I've progressed through a few test prints of the Howlden Lavatory Composite. The coach body now has an integral roof while the interior is now part of the under frame. I've still got a few design tweaks to make but things are looking promising. I've tried to incorporate the beading that is right at the base of the body. Unfortunately, this is a very thin section and prone to warping so I think I'll have to remove it from the CAD. Will anyone notice that it is missing on an N gauge coach? The bogies are 2mm Association etches that I've temporarily borrowed from another project. I think this has potential as a layout coach! Also, my thanks to John who has kindly identified the diagram numbers for the other coaches in this set. Isinglass drawings for these have now been ordered.